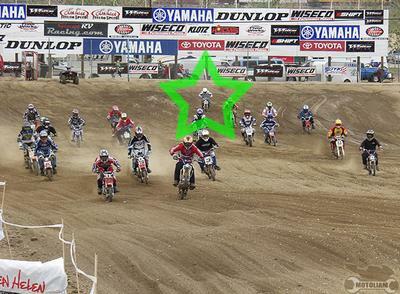 This race was at Glen Helen, on the big track! This was a two day competition, the White Brother's Four Stroke National, and I (obviously!) bogged the bike at the start. Not that it would have made a difference, as I was thoroughly trounced. Sleeping in the front seat of a '97 GMC Jimmy in a church parking lot overnight, with the tail end backed up against a wall to inhibit theft, didn't make me especially chipper the following days, . Not to mention the ruts, which in some areas where much deeper than the 10" wheels I was running! Overall, it was a blast, and if you haven't tried wringing a small bore bike to it's limits, give it a shot. You'd be surprised how much translates to the bigger bikes. Since then, I've improved a lot on the little bikes and if you're curious about racing, this is a great way to get involved with a fun, happy group of people. You don't need big money, a big truck (one guy carries his bike around in the backseat of his civic! ), or a big ego. It's backyard racing at it's best and I highly suggest looking into it. Not to mention how cheap it is to swtich tires and go Mini-Supermoto racing! Fast50's was the first company to give me a shot (and some backing!) and if you're interested in learning more then check them out here! The "roots" page definitely hits the nail on the head!